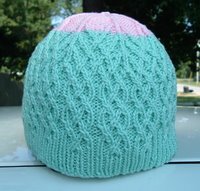 I’ve managed to finish four hats this month to send in to Caps for a Cure. Two are Odessa (both beadless), and two are Shedir. I ran out of yarn on the second Shedir towards the top. I took a risk and added in a different color. At first I wasn’t sure and thought that I would frog it. I went ahead and finished it and then solicited opinions. The general consensus was that it is cute this way, and I agree. Then when I found myself tugging at the hat on my head in attempts to make it fit me so I could keep it, I became sure that the hat is good enough to give away. As soon as I got the second Shedir off the needles, I cast on for the next Odessa. I loved knitting with the Cashsoft. It was so generous of Louise to hold that contest for the group. These hats are bound for South Carolina. 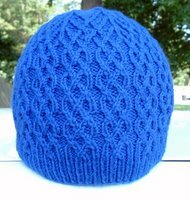 I really need to work on my photographic skills (or a lack thereof, rather), and perhaps purchase a form for modeling the hats I knit. We’ve extended the normal two months per group time line to three months due to summer. 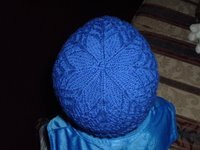 That means I’ll have the opportunity to knit more hats before we rotate to a different spot. Have you been keeping up with the news? A war is beginning, and soon. I’m not sure how I feel about it, though. At first I just had to read about it when I saw the headline. Should I get involved, or am I just going to sit back on the sidelines and watch events unfold the way I have so many times in the past? This definitely calls for some time spent seriously contemplating all of the issues concerned. One shouldn’t take lightly the commitment of joining in on such an endeavor. I’d like to encourage all of you to investigate the situation for yourselves. I feel like some of you may want to be a part of this quest. Go ahead, check it out, you might just be surprised. Raise your hand if you thought this was going to be a post about the new KnitPicks Options knitting needles. Hmmm...I guess most of you rightly discerned that I would have been unable to keep quiet if I had ordered them, and that I would not have waited for them to arrive to begin blathering on about the subject. Now, just because I haven't made an order doesn't mean I don't have something mailbox related to share. Monday was a wonderful mail day. 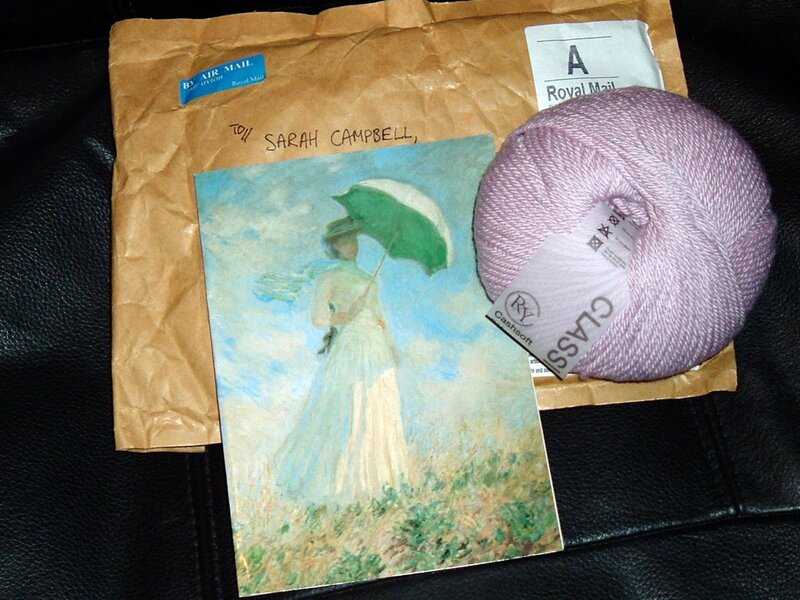 I received the lovely Cashsoft from Louise, which in and of itself was enough to make my day. As I flipped my way through the rest of the mail I did not expect anything else to delight me, but I received a happy surprise. My epoll reward had arrived. I had cashed in my points for an Amazon.com gift certificate awhile back. I hadn't expected it to show up this soon. I think I'm going to buy knitting books, of course, but which ones? I reviewed my wish list; at first this only spawned more indecisiveness. 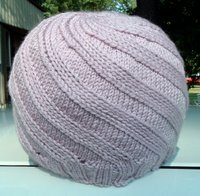 In order to narrow things down a bit I considered what types of things I most like to knit. I love knitting many things, but perhaps lace, socks, and shawls most. Next I thought about the books that have spent so much time on my wish list but haven't made their way into my library for some reason or another. I think I have whittled down the list of possibilities to a more manageable number. If it were up to you, which of these books would you choose? Are there any books on this list that you would advise me to avoid? If you must, you may nominate a different book than the ones I have listed. I'd love to hear your thoughts. Ever since I read that I had won, I had something positive on which to set my sights. When I knew that the package had been posted, I could make trips to the mailbox accompanied by eagerness, rather than dread. Tonight as we drove home, I told Bruce that a package would likely be waiting for me in the mailbox. Finally, the moment had arrived. I reached inside and extracted a wondrous parcel that had been sent to me from across the pond. Thank you, Louise! The Cashsoft so generously offered up in your contest will soon be transformed into a cap to comfort someone in need. I think my current Shedir just might be temporarily set aside. Last week has been canceled. Yes, you read correctly, last week has been canceled. Informal survey and research has shown that many people consider last week to have been extremely unfortunate; therefore, it has been canceled. You may now disregard any worries or concerns that may have arisen. There are no plans to reschedule. We sincerely regret any inconveniences this may have caused. We now return you to your regularly scheduled calendar, already in progress. Thank you. Have you seen these? 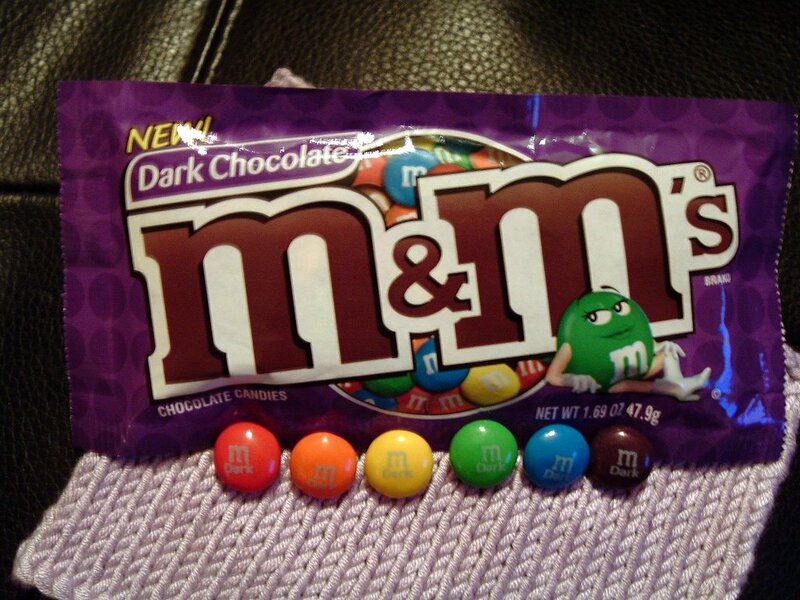 I really enjoyed the Dark Chocolate M&M's when they had their short run as a part of a Return of the Jedi promotion. Now they are widely available all the time. This may or may not be a good thing. For now, I'm trying to focus on the positives. 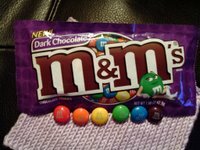 If you look beneath the candy, you can see my latest swatching. The swatch is good. 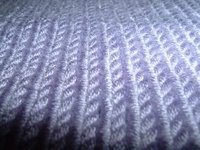 The yarn (Royal Bamboo, Plymouth Yarn Co., Italian Collection) is wonderful to knit with, the fabric is fabulous, but I think the swatch and its yarn will sit a bit. I had thought that it would be either the Bonita Shirt (IK SU 2006) or the Ballet Camisole. I had nearly settled on the Ballet Camisole, but then I had problems. The biggest problem is that my brain won't function well enough to choose the proper size to knit. The next issue is this and this. Anything look familiar? 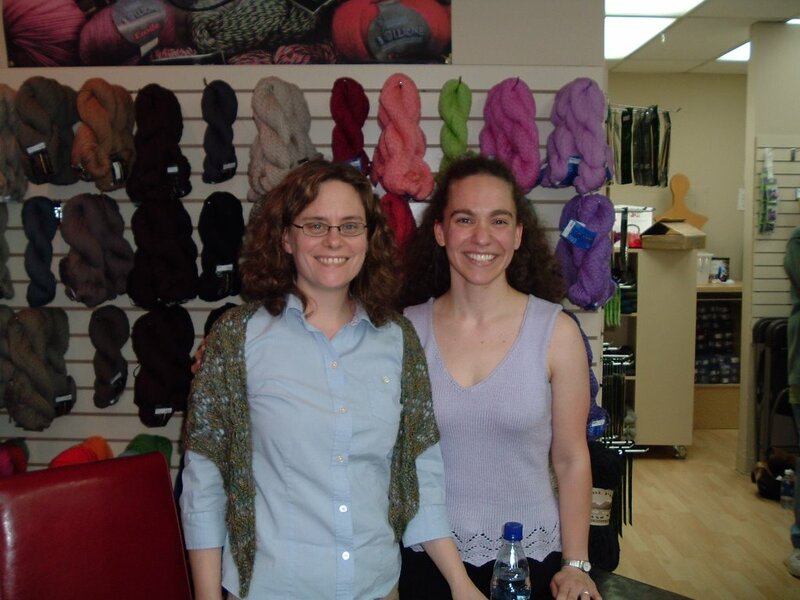 Yeah, it would seem that I could be knitting the same top (more or less) over and over. Even the color between the prospective Ballet Camisole and the already knit Soleil is nearly identical. Still, if I could measure, think, and choose, I believe I would knit the Ballet Camisole. I've swatched and have gauge. 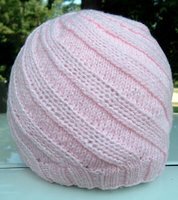 Perhaps I should just knit the smaller of the two sizes I'm vacillating between and then exercise like mad whenever I'm not knitting the top. Mostly though, I feel like going back to bed. Perhaps lace would help. I don't know why, but sometimes it does. I'm having trouble knitting. 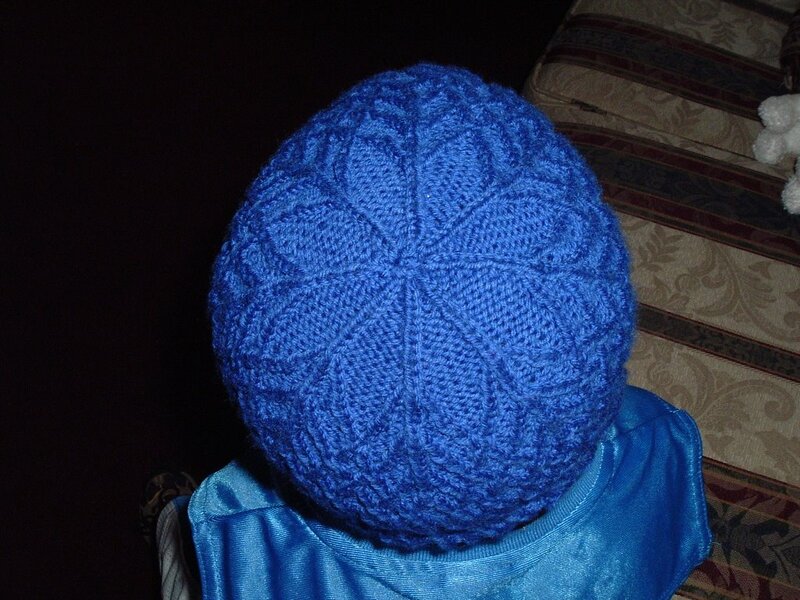 Perhaps I should work to be less inwardly-focused and work on my second Shedir for Caps for a Cure. That seems like the best thing to do. That, and work out some more. I got a new set of exercise dvds. I'm still working out the steps. The choreography is a bit more complex than I'm used to doing. I've only done the Cardio Blast (haven't tried the Weight Loss one, yet) dvd so far. It sure makes me sweat. 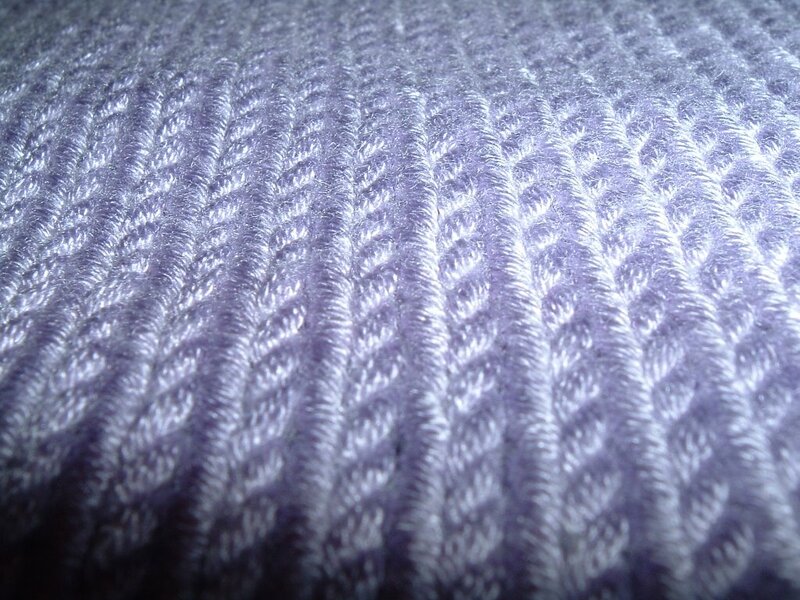 Miles of stockinette stitch stretch across the landscape. The never ending columns march on toward the edge of the world. Shadow and light reveal the soft, flowing nature of the fabric. Actually, it's just a swatch. Details to come, once I figure things out. In continuing with our theme of feeling uninspired, I must say that I'm not very interested in watching Passions, lately. To be honest, I've lost interest in most things, but we'll pick on this wacky soap for today. Throughout the spring and summer they had a storyline taking place in Rome. There were collapsing catacombs, virtual reality wolves, a hunchbacked nun, a pope, a chalice, Swiss guards, a mystery monk, bad writing, and sadly predictable disappointments. What did we really expect, anyway? Whether you're a disenchanted viewer or not, why don't you check this out? It has nothing to do with the soap. It is a blog detailing the real-life Roman adventure of my amazing friend, Susan. I don't know about you, but Thorn and Thistle doesn't make me think of anything I'd like to have next to my skin. Still, I like my new summer top. It is so soft and lovely. The picture does not do it justice. I was using the self-timer function of the camera to take the photo. I would have enlisted my husband's help, but he isn't wild about taking a million shots (he would say that they all look good and that he can't tell the difference between them) for me to declare that I don't like any of them, and then to hear me drone on and on about how I dislike my body. I can't say that I blame him. I'm trying to keep busy to drown out my own thoughts on the subject because I'm just not in the mood to put up with me. I still have to weave in the ends from doing the crochet finishing around the neck and arm openings (my, oh, my, how that made a difference), wash it again, and then it will be ready for wearing. Well, I guess I won't be wearing it until I can calm down a bit and really love the top again properly. I go through a bit of post project dislike in which I feel I didn't knit well enough, I'm ugly, I'm fat, it's not good enough, blah, blah, blah. Yeah, just typing it makes me tired and bored. You don't want to spend time in my head. I'm thinking of stepping out of it for awhile, but I've never quite perfected that move. Besides, getting back in can be particularly tricky. Enough of that. I know that if I'm boring myself, I've likely lost most of you. Are you ready for the details (as best as I can recall them)? The Thorn & Thistle is nearly complete. I'm waiting for it to dry so that I can seam the sides and then work the edgings around the neck and armholes. I really like the way it is turning out so far. I was able to complete all the knitting except for the three-needle-bind-off at the shoulders while I was at my Tuesday afternoon knitting meeting. 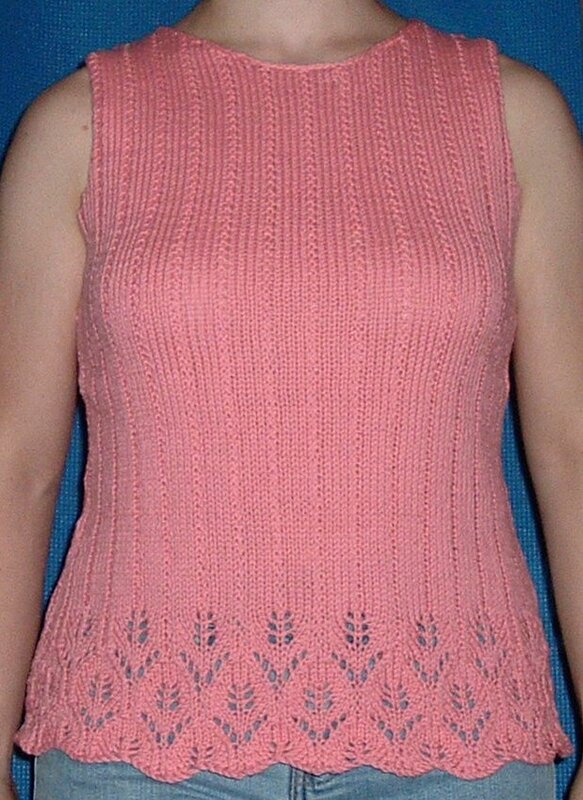 I guess it's time for me to decide between Bonita (IK SU 2006) and Ballet Camisole (July 06 Magknits). I suppose I could start swatching with my yarn and see if that helps me decide. I know I was going to change Bonita (a bit less of the lace on the front and no embroidery), and I felt a little unsure of it for me. Deciding which cute top to knit for myself is a happy dilemma. I was able to wrangle my nephew for a moment to capture this picture of Shedir. This doesn't show the color well, and I couldn't get him to hold still long enough to take a picture of the side cabling. In all fairness, the hat is too big for him and it was very hot. We can all be impressed that I was able to get this image. I love this hat. It will be sent off with others to the Caps for a Cure group. I think I want to knit it again. I may have already chosen the yarn. It is a mystery yarn with no label. I must test swatch, first. I've finished Mary Ann's Cashmere & Pearls Lace Scarf (yes, I know it's been renamed Angel Pearls Beaded Scarf). It is blocking, and I haven't gotten a good picture of it yet. I figure I'd limit today's post to one poor quality picture. I need to redo the bind-off on two pairs of socks. They have sat in a sat state of near-finishedness, but I just haven't been able to sit down with them and do the work. I was so excited to get them done, and now I'm just blah about taking out the bind-offs and redoing them. The Thorn & Thistle top is nearly done. I've completed the back, and the front is worked nearly to the point where I'll be working the shaping along the neckline. IK is pleasing me. Thanks to a head's up from one of my Monday Night Knitting Buddies (or Knitters Anonymous as the Ultra-Friendly Barnes & Noble Starbucks Guy wants to call us), I checked out the preview for the Fall 2006 issue. There might be enough patterns I like to purchase it. I'm not sure, though. I really love that Swallowtail Shawl. One pretty lace pattern can be enough to make me think that an entire issue is worth buying. Most of the time I end up putting a magazine back when it is just one pattern tempting me, but that might not happen this time. 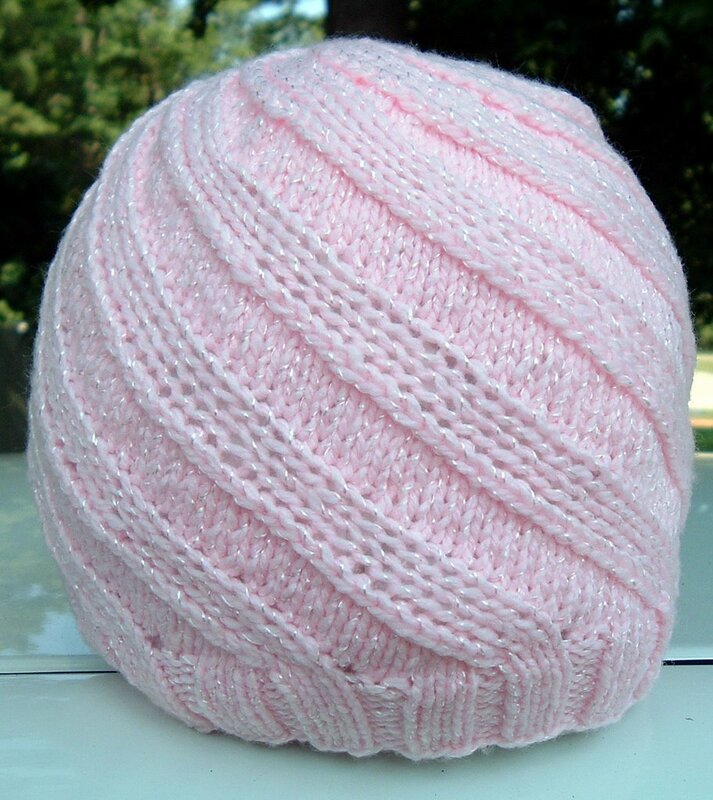 I mean, just one lonely ball of Misti Alpaca Lace to knit such loveliness? How can I refuse? Maybe Mom would like it. I also think she might like Snowman and Skates. She would definitely want it button-up style, but steeks frighten me. I like the other patterns in the booklet, too. They may just be beyond me for now. Still, maybe it is just being up at 2:13 in the morning, but making us matching vests appeals to me a bit.